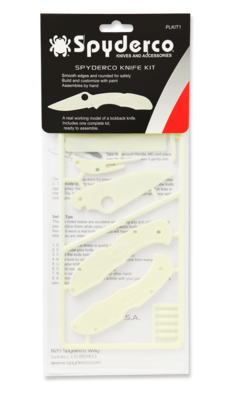 Plastic Kit Delica 4 - Spyderco, Inc. Page 888 – Spyderco, Inc. Teach your kids about knives the safe way and enjoy a fun family project in the process! This all-plastic kit is a faithful reproduction of Spyderco’s best-selling Delica®4 folding knife. Designed for ages 7 and older, it can be assembled in minutes without tools or glue and yields a completely safe working model of a Delica4. Precision molded from glow-in-the-dark plastic, all parts are rounded for safety and designed so the knife can be assembled and disassembled numerous times. 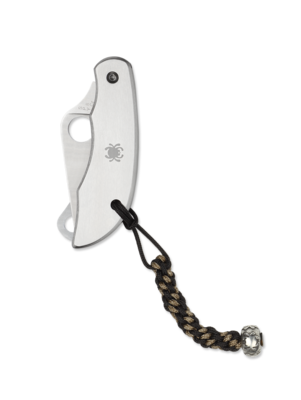 The perfect tool for teaching youngsters about safe knife handling and the inner workings of a back lock folder, this kit is also a fun collector’s item for all Spyderco knife fans.